Tetovo (Macedonian: Тетово, [ˈtɛtɔvɔ] ( listen); Albanian: Tetovë/Tetova; is a city in the northwestern part of the Republic of North Macedonia, built on the foothills of Šar Mountain and divided by the Pena River. The municipality of Tetovo covers an area of 1,080 km2 (417 sq mi) at 468 meters (1,535 ft) above sea level, with a population of 52,915. The city of Tetovo is the seat of Tetovo Municipality. In antiquity, Tetovo was a Greco-Roman fortress-town in eastern Illyria, called Oaeneon (Οαίνεον), in Latin Oaeneum, located on the pass between mount Scardos (now Šar) and river Artatos (later called Oracha, now Pena), a tributary to river Axios (Αξιός) in Greek, or Bardar in Slavic. This was a territory where the Illyrian tribe Penestae lived, and it included the fortress-towns Draudacum, Uskana, Divra and Styberra in northern Pelagonia. Various archaeological findings suggest Tetovo was first inhabited thousands of years ago. Near Tetovo/Oaeneon, a Greek sword of the Mycenean era and a bronze statuette of the 6th c. BCE have been found, discerning a Greek presence since the 2nd mill. BCE. Subsequently, Oaeneon was ruled by many ethnic groups; the Illyrian Genthius of the Labeatae, by King Perseus of Macedonia, by the Romans, by the Byzantines, by the Slavs, by the Bulgarians, and it was invaded by the Avars. In the 15th c. AD, Oaeneum came under Ottoman rule for about five centuries. Then, the city's population was forced to convert to Islam and many Ottoman-style structures were built, such as the Šarena Džamija and the Arabati Baba Teḱe, which still stand as two of Macedonia's most significant landmarks of its Ottoman period. During this period, the town belonged to the Vilayet of Kosovo, became a firearm and cannon foundry, and was renamed Kalkandelen (meaning Shield Penetrator); as a result, the town attracted many workers (Albanians, Bulgarians, Serbs, and Roma) and grew to a city. Following the World Wars, Tetovo became a part of Yugoslavia and, later, the Republic of Macedonia. Tetovo has historically been home to multiple ethnic groups, however, as the home of multiple ethnic Albanian political parties and a population in which Albanians form a majority, Tetovo has become the unofficial capital and centre of a predominantly ethnic Albanian region which extends in an arc from Tetovo to Struga. Over one-third of the city is inhabited by ethnic Macedonians. Tetovo historically had a large Turkish population, forming nearly one-quarter as recently as 1961, though it now makes up under 4% of the city. Just outside Tetovo is the South East European University, North Macedonia’s third largest university after Skopje and Bitola. Tetovo is also home to the State University of Tetovo. There have been archaeological discoveries near Tetovo which date back to the Bronze Age (2200-1200BC). In the Republic of North Macedonia, the oldest artefact, a Mycenae sword from the Bronze Age, was found outside Tetovo. It is now on show in the Museum of Macedonia in Skopje. In early antiquity, Tetovo was first mentioned as Oaeneum. The early inhabitants of Oaeneum were the Penestae, an Illyrian tribe that controlled the regions of Oaeneum, Draudacum (Gostivar), Uskana (Kicevo), Divra (Debar) and the main outlets towards Styberra (Prilep) in northern Pelagonia. Remote though it was, the territory of the Penestae had strategic importance. It provided one of the few passages from Illyria to Macedonia and Dardania to Macedonia via Oaeneum-Draudacum-Uskana-Styberra. In the period of 800–550 BC, the Dardani broke into Pelagonia via Tetovo and Gostivar and pushed the Phrygian Bridges there into the northern hills. It is probable that they overran Lyncus, Eordaea and Edessa. The Illyrian influence of the region has been noted in the archaeological discovery of a statue of bronzed dancer from the Illyrian period, 6th century BC. In 171 BC, Gentius was allied with the Romans against the Macedonians, and together in 170 BC, the Romans led by Appius Claudius were on the verge of victory. However, Gentius in 169 BC changed sides and allied himself with Perseus of Macedon and led his army to a victory over the Romans in Uskana via Oaeneum. In 169 BC, Oaeneum fell into the hands of the Romans again. The Penestae were generally allied with the Romans. After the conquest of Uskana, Perseus marched his army towards Oaeneum. The location of the town was a good one, and in particular there was a pass there to the Labeatae, Gentius’ kingdom. One of Perseus’ men familiar with the area said there was no point in taking Oaeneum unless he controlled Draudacum. Perseus took Draudacum with ease. However, when Perseus reached Oaeneum, it could not be taken without a full-scale assault. Its strength lay in having rather more men of military age than other places, in the fortified walls of the town, and in being enclosed on one side be a river and on the other by a mountain which was very high and difficult of access. These factors gave the townspeople some hope of resisting. Perseus invested the town and began constructing a ramp on the upper side of the city; its height would bring him up over the city walls. As soon as the ramp reached the city wall, the assault began and led to Perseus capturing Oaeneum. The town was plundered and the adult males were slaughtered. Oaeneum remained with in Illyricum until Diocletian's reform and Oaeneum became a part of Epirus Nova in the 4th century AD. Due to the large barbaric incursions by the Celts, the Ostrogoths led by Theoderic the Great and the Huns from the 3rd century AD, the Romans started to build strong in-wall cities and fortresses on dominant hills around the area of Oaeneum. Christianity spread to Oaeneum during the later period of Roman invasion and reached the region relatively early. St Paul preached the Gospel in the region. In the 2nd to the 4th centuries, the main language to spread the Christian religion was Latin. However, after the Byzantine Empire was formed from the Roman Empire, Greek was the main language used. After the strong Avaric-Slavic incursions in the late 6th century AD, all the fortresses were abandoned but not entirely demolished. Before the middle of the 9th century, the region became part of the First Bulgarian Empire. The area came under Byzantine rule again in 1018. In the 13th and 14th centuries, Byzantine control was punctuated by periods of Bulgarian and Serbian rule. Konstantin Asen ruled as Tsar of the Bulgarian Empire from 1257 to 1277. Later the region was overrun and taken by Serbian Tsar Stefan Dušan. After the dissolution of the Serbian Empire, the Mrnjavčević house took the region. This did not last as the Ottomans made their way to the region. The initial Ottoman occupation did not last as Skanderbeg and his Albanian force with aid from Tetovo, took on the Ottoman forces led by Ibrahim Pasha in the Battle of Pollog. Skanderbeg slayed Ibrahim Pasha, who was an old friend of his during his time with the Ottomans. Tetovo came under Albanian control. In August 1462, After Skanderbeg defeated Ottoman forces under Hasan bey in Mokra, Isuf bey went to move against Skanderbeg. Isuf bey marched out with 18,000 troops to Uskub. From there, he marched onto Pollog near Tetovo. Skanderbeg attacked and annihilated Isuf's force and the Pasha fled, leaving his army behind to be reduced. At the end of the 15th century and after the death of Skanderbeg, Tetovo fell under the rule of the Ottoman Empire. According to the 1455 defter records, Tetovo had an Albanian presence. official Ottoman statistics of Nahiya Tetovo, in 1452 there were 146 Christian households and 60 Muslim, 1453 the population consists of 153 Christian and 56 Muslim families, and in 1468 - 180 Christian and 41 Muslim families, in 1545 there were 99 Christian and 101 Muslim families (38 were islamicised), in 1568 there were 108 Christian and 329 Muslim (184 islamicised). During the Ottoman period, the town was known as Kalkandelen, which means Shield Penetrator, in honor of the local weapon-smiths. Their superior craftsmanship extended to the advent of small firearms and cannons, which were traded all over the Balkans. The small hill above the town, near the present-day village of Lavce, has been fortified since Paeonian times and the Ottomans also built a substantial fortress there, known as the Baltepes fortress. A number of mosques were built, such as The Colored or Painted Mosque (Aladzha or Sharena Dzamija), also known as the Pasha Mosque, was built in 1459 by the Ottoman Turks; and in the 16th century, the Bektashi order also settled in Tetovo, where they remain at the Bektashi Teke. Tetovo under Ottoman tutelage became an important trade center for the local farmers and craftsmen, as well as an important military fortification. Haci Halife in the 17th century noted in his writings that Kalkandelen was expanding at an amazing rate in its lowland areas. During the early 19th century, Abdurrahman Pasha, a prominent Albanian landowner, beautified the city of Kalkandelen, refurbishing many estates including the notable landmarks such as the Colored Mosque, the Teke and the Baltepe fortress. In the 19th century, the Russian diplomat Ivan Jastrebov spoke highly of Kalkandelen's climate, liking the mild snowy winters, sunny and comfortably warm summers. The traveler Ami Bue described Kalkandelen as a very clean city. By the 19th century, when the population of Kalkandelen began to increase with settlement from the surrounding villages, the French traveler Ami Boue noted that the population had reached about 4,500 people, which are Bulgarians and Albanians. The total population of the Pashalik of Kalkandelen (Tetovo) is 30,000-40,000 and consists of Bulgarians who are Orthodox and of Albanian who are Muslims. According to British diplomat and traveller Aubrey Herbert, and English traveller Austen Henry Layard, the majority of the inhabitants of Kalkandelen were Albanian. Turkish sources cite that three-quarters of the population of Kalkandelen during the Ottoman period were Albanian. According to the statistics of the Bulgarian ethnographer Vasil Kanchov in 1900 the population of Kalkandelen consists of 8,500 Bulgarians, 9,000 Turks, 500 Arnauts and 1,200 Romani. According to the statistics of the secretary of the Bulgarian Exarchate Dimitar Mishev in 1905 the population of the town consists of 7,408 Bulgarians and 30 Roma. In the Ottoman Empire, Kalkandelen came under the Vilayet of Kosovo and was orientated towards Albanians and the Albanian struggle for independence from Ottoman rule. In 1843, the Uprising of Dervish Cara led to Albanians revolting against the Sultan due their disagreement with the Tanzimat reforms. Kalkandelen was liberated by Dervish Cara from January 1844 until September 1844, where Omar Pasha defeated the rebel forces and Kalkandelen remained within the Ottoman Empire. During the breakup of the Ottoman Empire, Tetovo came under Albanian control by forces led by Hasan Prishtina. From a period between 1913 and 1915, during the Balkan war, the Serbian Army captured Tetovo and the entire region of what is today North Macedonia became known as "South Serbia" as part of the Kingdom of Serbia. During World War I, a rift occurred between Bulgaria and Serbia. The Bulgarian army started making way through the area and annexed Tetovo and the rest of the Macedonia region. In 1916, under the Kingdom of Bulgaria, the Bulgarian registries had recorded that Tetovo had a population of 22,000. Two-thirds of this population was listed as Albanian and one-third consisted of Bulgarian and Serbian. At the end of the war Serbia regained control of the region. Within the Kingdom of Yugoslavia, Tetovo was part of the Vardar Banovina from 1929 to 1941. Under Royalist Yugoslavia, a crackdown on Albanians forced many from Tetovo to immigrate to the US and Canada, while thousands of Serbs were encouraged to move into the town to develop the mining and hydro-electric industries. Orthodox churches were built, skiing and pony trekking started in the Sar Mountains and White Russian settlers arrived; the town was booming. In 1941, the Vardar Banovina ceased to exist as a result of the Axis occupation of Yugoslavia. Tetovo once again came under Albanian rule. The Balli Kombëtar ruled Tetovo with military and financial aid from the Axis powers. The Albanian national flag was raised in Tetovo, the Albanian Franc was introduced as the official currency as well as the official language and education facilities in Albanian. With the Germans losing the war, the situation favored the communists. The new Serb settlers set up the Macedonian Communist Party, founded on 19 March 1943 in Tetovo, but by then the Albanian Communist party was also fighting for the town. Despite Allied victory and the formation of SFR Yugoslavia, In 1944, Tetovo's Balli Kombëtar remained and was still involved itself in a battle against the Yugoslav armed forces. The battle against Yugoslav forces lasted until 1948, where they were finally crushed. The town became part of the Socialist Republic of Macedonia. The early years of Socialist Yugoslavia were turbulent for Tetovo’s Albanian population. Many were subjected to repression, causing many to emigrate. Those who remained demonstrated periodically but violently against the communist regime, notably in the Yucel Incident of 1957 and the Kalkandelen Incident of 1968. Many of these protest were led by Mehmet Gega, a notable Albanian rights activist who was sentenced to ten years in prison. In the 1968 demonstrations, The Tetovar Albanians demanded for the attachment of the Albanian areas of Socialist Republic of Macedonia to Kosovo and their joint reconstitution as a seventh republic of Yugoslavia. The authorities rejected this demand and instead authorised the revision of syllabuses and textbooks in order to curb what it called ‘‘The penetration of Albanian nationalistic, irredentist and counter-revolutionary tendencies through printed textbooks and other literature.’’ In 1974, a new federal constitution was ratified which eased the tension of the local Albanians. The government of Yugoslavia viewed these demonstrations as the first stage in an Albanian plot aimed at eventually separating these areas, and joining them with neighboring Albania. SR Macedonia imposed harder prison sentences than the authorities in Kosovo. Tetovo under Josip Broz Tito's Yugoslavia went through major changes. Many Communist styled apartments were built around the city centre of Tetovo as well as concrete roads. New suburbs such as the Hajdućka suburb were formed to help accommodate the rising number of Macedonians moving to the city. Some of the city's historic buildings, such as the Old Mosque, were demolished by the authorities. When troubles in neighbouring Kosovo began in 1981, Tetovo had to be put under control of paramilitary police due to the rioting and show of sympathy with the Kosovar Albanians. The same happened again in 1989. When it became obvious in 1990 that Yugoslavia was about to fall, over 2,000 ethnic Albanians marched through Tetovo demanding secession from the Socialist Republic of Macedonia and unity with Albania. Self-determination of an ethnic minority within a state was not a right under the Socialist Republic of Macedonia’s constitution, and protesting their lack of representation under the constitution of a new Republic of Macedonia, the Albanians of Macedonia boycotted the referendum on independence from Yugoslavia and were thus excluded from almost any representation in the new government. Tetovo became headquarters of the new Albanian political parties, which were regarded as unconstitutional by the Republic of Macedonia. Tensions worsened, Tetovo, along with the city of Gostivar, took in and sheltered several thousands of Bosnian Muslim refugees from 1992 until the end of the Bosnian war. Prior to the NATO bombing of Serb forces in Kosovo, Tetovo became the rear supply base for the Kosovo Liberation Army, and then later home to over 100,000 Kosovar refugees from the Kosovo war. In 1997, Alajdin Demiri, the mayor of Tetovo, was jailed for raising the double headed eagle flag of Albania from Tetovo town hall, and by 2000 the outbreak of hostilities in Tanusevci had spilled into the towns of Tetovo and Gostivar. In 2001, ethnic Albanians launched an insurgency, with Tetovo being the main backdrop of the war. Fortunately, the Ohrid Agreement was established, allowing peace to return to the city again. In economic terms Tetovo is one of the most developing cities in North Macedonia with some multinational companies (Ecolog International, SUVAFIX Renova, Zikoprom) being located in this town. Despite the interest of private companies in Tetovo, the city is neglected by the government. Tetovo suffers from urban sprawl. Due to the lack of government regulations, the city has no system for building permits, and many houses and buildings have been built unsafely and randomly along footpaths, roads and in parks. Air pollution levels are among the highest in Europe. The tallest building in the city is REM center measuring about 80 meters in height. Tetovo is one of the educational centres in North Macedonia hosting two universities South East European University (Public Private Non-profitable) and State University of Tetovo (Public University). The prior one has educational leadership in the region, whereat the Bologna Process is applicable since its establishment, has the best campus in the region of South East Europe and is trend with international developments in education. More than 20,000 students get their education and degrees in Tetovo. 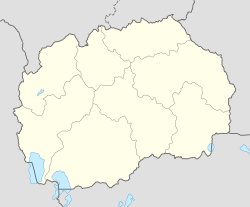 In addition, Tetovo is a centre of ethnic Albanian politics. Most Albanian political parties on North Macedonia (Democratic Party of Albanians (DPA), Democratic Union for Integration (DUI) and the Party for Democratic Prosperity (PDP)) have their main seats there. Tetovo has one of the highest crime rates in the Republic of North Macedonia, second only to the much larger capital Skopje. The city was home to 1,229 criminal acts in the first half of 2009. On 6 July 2014, violent protests occurred in the town where about 600 youths hurled stones Sunday at police outside the headquarters of the Democratic Union for Integration, an ethnic Albanian junior partner in parliament. The protesters were disillusioned and frustrated with their political representatives Ali Ahmeti and Menduh Thaçi and the political parties. Police dispersed the crowd by force. There was no violence reported at any other protests in the country. Tetovo has been under many different empires; from the Mycenae and Illyrians, to the Romans, Byzantines and Ottomans, giving the city a vast range of diverse cultures. Historically, Tetovo has been a nationalist center for Albanians, the more well known being Dervish Cara, Mustafa Ruhi Efendi, Tajar Tetova and Mehmet Pashë Dërralla. The museum of Tetovo, established in 1950, contains history of Tetovo and is situated in the Memorial House of Central Committee of the Communist Party of Macedonia. The main attractions of Tetovo are its historic areas and structures. The Šarena Džamija ("The Painted Mosque") is located near the Pena River in the old part of town. The mosque was built in 1438 and rebuilt in 1833 by Abdurrahman Pasha, the son of Rexhep Pasha. It is one of the most important cultural and historical structures of Tetovo and represents the style of early Ottoman architecture. The painted mosque continues to be an important monument to the residents of Tetovo, and is the main tourist attraction for many foreign visitors. The Hamam next to the Pena River in Tetovo was built around the same time as the Šarena Džamija and was mainly used for Wudu (avdes, abdest). The Baltepes Fortress, located on the top of the Baltepes hill, above Tetovo was built in 1820 from Abdurrahman Pasha. The Baltepes had a series of tunnels from all the main Ottoman houses in the town leading to the fortress. The thinking behind the tunnel system was to enable the defenders of the fortress to escape behind enemy lines if the fortress was besieged, allowing the besiegers themselves to be encircled. The last tunnel collapsed in the 1960s and since excavation started, two of the tunnels, to Selce and Lavce, have been found. Many local stories and myths, such as "The Tale of the Water Pump", are set at Baltepe as they focus on the three-year stay of Abdurrahman Pasha of Kalkandelen in the fortress of Baltepe, located on the "cold and dark" Shar Mountains. The old settlement of Oaeneum is believed to be located around where the fortress of Baltepe resides. The Arabati Baba Teḱe originally built in 1538 around the türbe of Sersem Ali Baba, an Ottoman dervish. In 1799, a waqf provided by Rexhep Pasha established the current grounds of the tekke. The finest surviving Bektashi monastery in Europe, the sprawling complex features flowered lawns, prayer rooms, dining halls, lodgings and a great marble fountain inside a wooden pavilion. Other notable historical features from the Ottoman period in Tetovo are The Saat Mosque ("The Clock Mosque") as the name implies it used to have a clock in its minaret, and the Kumluk Mosque ("The Sandy Mosque"), an old mosque in the upper bazaar area of Tetovo. The name is derived from the reddish-yellow exterior of the mosque. An example of Byzantine culture of Tetovo is the Monastery of Lešok. The monastery is 8 km (5 mi) outside Tetovo. In its complex are the churches of St. Athanasius of Alexandria and the Holy Mother of God Church. The Church of the Holy Virgin, built in 1326, is an excellent example of Byzantine style and architectural tradition. Popova Šapka is a ski resort located in the Šar Mountains. Despite being around seven kilometres (4.3 miles) from the city, it is generally associated with Tetovo. Popova Šapka attracts many tourists in winter due it being one of the popular ski resorts in the former Yugoslavia. Aside from hosting recreational and competitive skiing competitions, Popova Šapka has many villas and restaurants to accommodate visitors. The rise in hotels was because the cable car that took people from Tetovo to Popova Šapka was destroyed during the 2001 Macedonia conflict. Therefore, people stay at Popova Šapka overnight before returning to Tetovo. Tetovo is home of the dish Tavče Gravče, known locally in Tetovo as Tavë me Groshë. During Socialist Yugoslavia, the dish was known around the country as Tetovski Gravče, in reference to the city of Tetovo, where the dish originates. Although different varieties of the meal are made around Balkans, the traditional Tetovo tavče gravče is cooked and served in a terracotta pot. Most cuisines in Tetovo have a strong Ottoman influence or foundation such as Ajvar, Sujuk and Gevrek. Tetovo is known for its barbecue restaurants, Qebaptorë, where Ćevapi and Pljeskavica are made. Byrektorës, pastry restaurants, are also common in Tetovo and produce Burek. Ëmbëltore, sweet shops, produce locally made traditional sweets such as Lukum, Tulumba, Kataif and Baklava. Boza is also fermented in Tetovo and is a common beverage consumed. The cuisines in Tetovo have a unique taste and flavour due to the local agricultural products used to make the cuisines. In North Macedonia, Tetovo Kashkaval cheese is the most popular as it is made naturally from sheep's milk from the Šar Mountains. During the Kingdom of Yugoslavia, apples from Tetovo were popular in Belgrade and were known as Tetovo Jabuka. The most popular sport in Tetovo is Football. Tetovo is represented by four clubs of which three play in the Macedonian First League. FK Shkëndija, supported by the majority of the Albanians living in Tetovo. FK Renova, mainly supported by Albanians but has significant Macedonian support, and are based in Džepčište. FK Teteks is the team supported by the Macedonians living in Tetovo. FK Ljuboten is another football club based in Tetovo and is the oldest football club in North Macedonia. FK Drita currently play in the Prva Liga, however, they are in located in the outskirts of Tetovo in a village named Bogovinje. FK Vrapčište currently plays in the Macedonian Second League, however, they are in located in the outskirts of Tetovo in the village named Vrapčište. Wikimedia Commons has media related to Tetovo. ^ Cohen, Saul Bernard (2003). Geopolitics of the World System. 4501 Forbes Boulevard, Suite 200, Lanham, Maryland 20706: Rowman & Littlefield Publishers, Inc. p. 220. ISBN 0 8476 9907 2. Retrieved 23 September 2014. ^ Cook, Bernard A. (2001). Europe since 1945: an encyclopedia. Taylor & Francis. pp. 814–. ISBN 978-0-8153-4058-4. ^ Trankova, Dimana (2011). "Tito, Teto and Some Troubled Tourism Await You in Tetovo, Macedonia". Balkan Traveller. Archived from the original on 2 October 2011. ^ a b c d e f g h i j k l m n o p Evans, Thammy (2012). Macedonia. Bradt Travel Guides Ltd, IDC House, The Vale, Chalfront St Peter, Bucks SL9 9RZ, England: The Globe Pequot Press Inc. pp. 238–239. ISBN 978 1 84162 395 5. Retrieved 26 February 2013. ^ Hawkes, C.F.C. The European Community in Later Prehistory: Studies in Honour of C. F. C. Hawkes. routledge library editions archaeology. Retrieved 8 December 2018. ^ a b Smith, William (2012). Dictionary of Greek and Roman geography, Volume 2. p. 457. Retrieved 26 February 2013. ^ a b c d e Hammond, N. G. L. (1988). A History of Macedonia Volume III: 336-167 B.C. great clarendon street oxford ox2 6dp: oxford university press. ISBN 978-0-19-814815-9. Retrieved 26 February 2013. ^ Pritchett, William Kendrick (2012). The Greek State at War: Part V. Berkeley and Los Angeles, California: University of California Press. p. 437. ISBN 0 520 07374 6. Retrieved 26 February 2013. ^ Venning, Timothy (2012). A Chronology of the Roman Empire. the tower building 11 York road London se1 7nx: continuum international publishing group. p. 148. ISBN 9781441154781. Retrieved 26 February 2013. ^ VICKERS, MIRANDA (1988). Between Serb and Albanian A History of Kosovo. Columbia University Press. ISBN 978-0-19-814815-9. Retrieved 26 February 2013. ^ Schnabel, Sckhard. Paul the Missionary: Realities, Strategies, and Methods. Downers Grove, IL: InterVarsity Press, 2008. p. 113. ^ Madgearu, Alexandru (2008). The Wars of the Balkan Peninsula: Their Medieval Origins. 4501 Forbes Boulevard, Suite 200, Lanham, Maryland 20706: Rowman & Littlefield Publishers, Inc. p. 27. ISBN 978 0 8108 5846 6. Retrieved 23 September 2014. ^ "Составот на населението во Тетовската нахија во XV век". Archived from the original on 28 September 2007. ^ Dankoff, Robert (2001). An Ottoman Mentality: The World of Evliya Çelebi. Koninklijke Brill. pp. 55–. ISBN 90-04-13715-7. ^ "City of Tetovo". Archived from the original on 7 January 2014. ^ La Turquie d'Europe; observations sur la geographie, la géologie, l'histoire naturelle, etc. (Paris, 1840), p. 306-307. ^ Herbert, Aubrey (15 June 2011). Albania's Greatest Friend: Aubrey Herbert and the Making of Modern Albania. Diaries and Papers 1904 - 1923. I.B Tauris. ISBN 978 1 84885 444 4. Retrieved 27 January 2014. ^ Gawrych, George (26 December 2006). The Crescent and the Eagle: Ottoman Rule, Islam and the Albanians, 1874-1913. I.B Tauris. ISBN 1 84511 2873. Retrieved 27 January 2014. ^ Merkezi, Türkiye Diyanet Vakfı İslam Araştırmaları. ". :: İslâm Ansiklopedisi ::". www.tdvia.org. ^ "Të dhëna nga regjistrimi i popullsisë së Tetovës në vitin 1916 (FOTO)". Tetova1. Retrieved 26 September 2014. ^ a b Ramet, Sabrina P. (1997). Whose Democracy? : Nationalism, Religion, and the Doctrine of Collective Rights in Post-1989 Eastern Europe. 4720 Boston Way, Lanham, Maryland 20706: Rowman & Littlefield Publishers, Inc. p. 78. ISBN 0 8476 8324 9. Retrieved 13 September 2014. ^ Poulton, Hugh (2000). Who are the Macedonians?. 38 King Street, London WC2E 8JT: C. Hurst & Co. p. 126. ISBN 1-85065-534-0. Retrieved 25 December 2015. ^ a b John Sparrow. "International Federation of Red Cross and Red Crescent Societies". Retrieved 10 March 2011. ^ Van Mead, Nick (13 February 2017). "Tipping point: revealing the cities where exercise does more harm than good". The Guardian. Retrieved 13 February 2017. ^ "MINA Breaking News - Skopje with highest crime rate". macedoniaonline.eu. ^ Besar Rexhaili. "Ramush Haradinaj Qytetar ndrei i Tetoves". Retrieved 4 February 2013. ^ Enisa Bajrami. "Tanja Fajon visited Tetova!". Retrieved 1 February 2013. ^ tetova.gov.mk. "Mesic: Tetovo is a home to people with different cultural backgrounds". Archived from the original on 21 February 2013. Retrieved 1 February 2013. ^ South East European University. "Ferid Murad, Honoured Guest of the SEEU Graduation Ceremony". Retrieved 1 February 2013. Wikivoyage has a travel guide for Tetovo.